If you look at the above chart, it is pretty clear why transcribing a lecture while listening is a bad idea – transcribing a 45 minute lecture would take almost 4 hours by hand and a little over 2 if typing or texting. On top of that you also need to copy anything on the board (and in the presentation if there are no handouts). The value of a transcript is for review, it actually hurts attention if done during the lecture. That being said, having lectures completely documented is really useful when reviewing before a test, especially if you can review faster than real time. 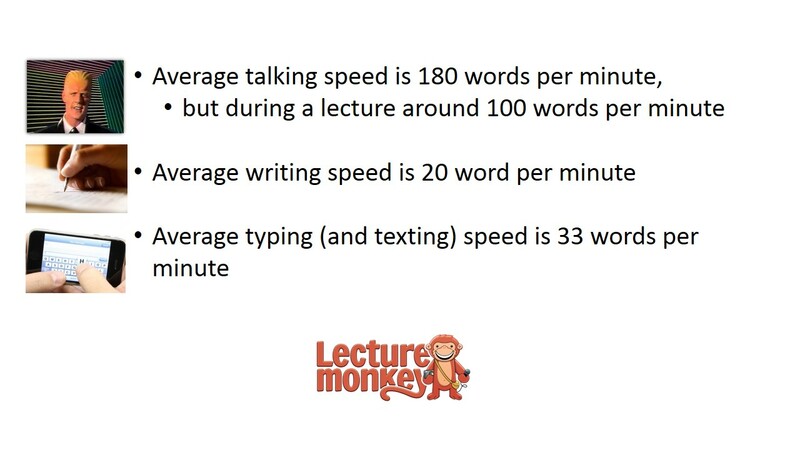 LectureMonkey is optimized to help review lectures quickly. The “fast talk” feature enables you to hear a lecture 30%-50% faster than real time. From the chart above it is clear that speeding up playback is especially useful during lectures, since lecturers tend to speak slower than normal. Bookmarks and comments is another feature that really speed review. Since LectureMonkey records everything said, written on the board and presented so you can concentrate on listening for the “important nuggets” (see my previous post on “Note Taking Strategies for College” for pointers on how to recognize those) and marking bookmarks when you hear one. It is also very useful to put in a short comment (like a text message or a tweet) to summarize the importance (don’t write what was said – that was recorded for you). Write comments using the abbreviations you know from texting and twitter – it will help you get the gist with minimal typing. Don’t worry about picking up the phone to type a comment and ruining the recording. LectureMonkey doesn’t mind being picked up for a minute during the recording for commenting, as long as you put it back in position when you are done. Classmates can also add bookmarks and comments by using the “Live Lecture” menu to find the current lecture and add their bookmarks and comments as note takers. By collaborating on bookmarks, LectureMonkey speeds up review before exams – giving you more time to do the things that matter to you. This entry was posted in Blog, Note taking strategy and tagged lecture notes, note taking, note taking guidelines. Bookmark the permalink.